Mayu Iwatani will defend her title inside Korakuen Hall in 2 weeks. Mayu Iwatani will look to defend her WOH World championship against Natsuko Tora on March 28th inside Tokyo’s famed Korakuen Hall. The match will air on Stardom World. 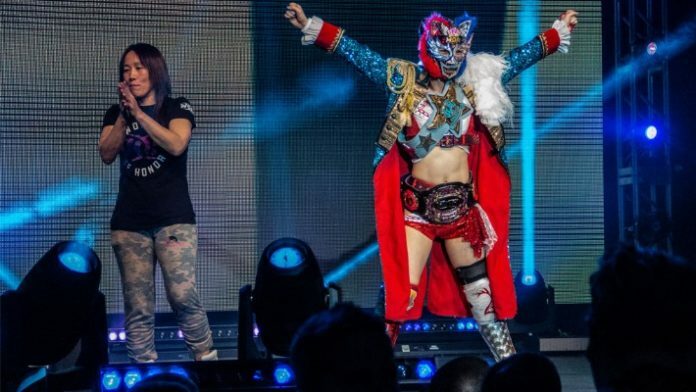 Iwatani defeated Kelly Klein for the title at Bound By Honor 2019 in Coral Gables, Florida on February 10th. 2 weeks later, Iwatani successfully defended the title inside Osaka Jo Hall in Osaka, Japan. She defeated Konami in what was her first title defence. 2 weeks ago, Iwatani again faced former WOH World Champion, Kelly Klein. Iwatani pulled a surprise roll-up victory after being dominated for much of the match by the former champ. ROH teased that the winner of the match will end up taking the WOH title into Madison Square Garden for the G1 Supercard. Iwatani was ranked #9 in the 2018 PWI Female 50 rankings. She’s achieved much of what is possible while in Stardom as well.